The Art of VFX interviews James Cooper, the lead compositor on Cosmopolis and he discussed the film's visual effects at length and mentioned Rob. Here's an excerpt of the interview + new images from the film. Sometimes Eric Packer occults the windows limo. Was there an on-set effect or is it your work? It was a combination of both, actually. Initially that was to be a practical effect but David wanted to have options as to when the windows became fully opaque and when they returned to tinted transparency. To this end he shot the parts of the sequences where he was certain they would be opaque practically but left numerous shots on the front and back end of those shots as greenscreen. This allowed him much more control as to the timing of when the windows fell into darkness and for how long and gave us references as to what they would look like fully darkened. Can you tell us about the design of the various screens inside the limo? The character of Eric sees much more than just price and volume variations. He has a unique ability to look at the many different patterns that the volatility of the stock, commodity futures and money markets generate, analyze them and predict where they will end up in the near future. Keeping that in mind we started with the production design references and adapted them, adding our own design elements and animations to create more visually interesting screens than might normally be seen on a trader’s monitor. Can you explain to us the shot in which Eric shots in his hand? Well, in terms of visual effects I can. For motivation you’ll have to talk to Mr. Cronenberg. Apparently Robert Pattinson and his handlers balked at the thought of doing this as a practical effect so he just pointed the (unloaded) gun at his hand and pulled the trigger. We added the muzzle flash, smoke, wound and blood splatter in compositing. Is there an invisible effect you want to reveal to us? 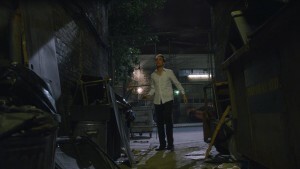 A particularly challenging shot has Eric entering an alleyway on a mission to confront his stalker. We needed to replace the building at the end of the lane way for continuity purposes but Eric passes through a chain link gate which is left swinging behind him. And, of course, the camera is moving as well. Production did not have a green screen big enough to cover the entire entrance to the lane way so we rotoscoped the gates, put them on cards in 3D space, tracked the camera and animated the roto to match the actual gate. All in all a very tricky shot. Well, of course, making the driving shots believable was a challenge, particularly since David has a slightly surreal aesthetic even in his more, shall we say, realistic films. I’m not sure that he wanted the cityscape outside to feel too real. I would say the biggest technical challenge was in the keying. He wanted to shoot the interior of the limo with tinted windows in place in very low light. This presented some challenges in that the green screen luminance was considerably less than optimal and, because of the high ISO needed to shoot in such low light, was much grainier than ideal as well. Of course we wanted to keep every hair on everyone’s head in the keys so we spent a lot of time finessing them.